Do you speak Drum Corps? Drum corps is an activity with a language all its own. Below are some key terms that corps members use to communicate with each other—and to confound "civilians." A member of the brass section, typically a trumpet player, who can play high notes with great ease. 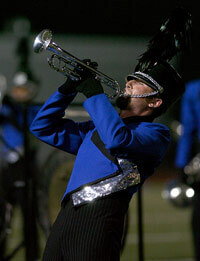 Wow, did you hear how awesome the Blue Devils' screamers were last night? They were wailing on notes way above the top staff lines! A term used on Drum Corps International judging sheets that categorizes the highest level of achievement a corps or individual corps section can attain. Box 5 is not only used by corps members as a general phrase for performance related classifications but in everyday usage as well. The Carolina Crown color guard showed Box 5 execution at the World Championships. Their performance was nearly flawless. The tuna sandwiches for lunch today were totally Box 5. I could have eaten at least three of them! An age-out is a corps member who has reached the maxim age of 21 or 22 years old to perform with a Drum Corps International unit. 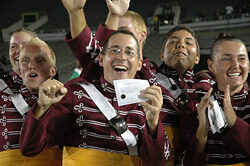 A rook-out is a corps member who is a first-year or "rookie" in his/her age-out year. Congratulations to all of this year's age-outs. Their dedication as members of this corps brought us to where we are today. We'll miss them on the field next year. Not wanting to pass up his last year of eligibility to start marching as a member of a drum corps, Juan decided that he'd like to spend his summer as a rook-out with the Phantom Regiment. A drum corps step-size that refers to taking eight steps between five yards on the football field. An 8 to 5 step-size is most often used as a standard unit of measure to mark off drill sets. Jimmy's 8 to 5 is impeccable. If we took out the tape measure, he'd be within an inch of the exact spot on the football field every time. A "basics block" or simply "basics" is time set aside during a rehearsal to work on and break down the fundamentals of marching. Corps members will generally assemble themselves in a "block" formation on the football field to break down marching techniques sometimes including posture, body carriage and step-size. My legs are killing me after this morning's basics block! The visual staff members worked us hard, but I know all of those small details we covered are really going to help make tomorrow night's performance awesome. Also known as "every-days," these are drum corps rehearsals that take up the entire day. All-days can run anywhere from 10 to 14 hours including breaks for breakfast, lunch and dinner. We've got two weeks of all-days scheduled at the beginning of the season to practice and learn the show before we can get out on the road and perform for our fans. A basic vertical flag spin where the silk of the flag "drops" toward the ground and then is brought back up by the opposite hand to complete a full circle or "spin." 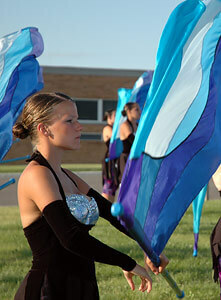 Many repetitions are often incorporated into color guard warm-up or technique sessions. OK color guard, set at right shoulder and give me 50 drop spins starting on the right hand. Brand name of a digital metronome generally amplified by corps to set tempos and rehearse music and visual passages. Take eight clicks from the Dr. Beat and then step off. A percussion term that refers to the distance between the tip of a drum stick and the drum head to be struck. Used to set playing levels and control musical dynamics, accurate stick heights also give the drum line a uniformed visual look. When it comes to playing levels, stick heights often used are 3", 6", 9" and full extension. Francis, check your stick height on that passage, you're at three inches and everyone else is at six. A small notebook that contains all of the "dots" or coordinates that a drum corps member marches to on the football field during a show. 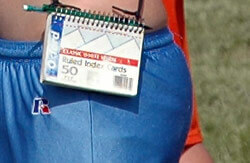 Dot books are often worn on the rehearsal field tied around marchers' waists or necks so that they can check and easily reference where they are supposed to be on the field. When Susie realized that she missed her ending set by five yards, she checked her dot book so she could see where she was supposed to be and correct her error in the next repetition.